Born in Jerez de la Frontera, Spain, Dr. Monguio fluent in both English and Spanish, practicing clinical psychology for over 21 years and now has an independent practice in Ventura, California. "I am capable of providing thorough and objective assessment of the complex issues involved in criminal and medico-legal cases, including organic/brain-based issues, mental illness, stress and trauma factors, psychosocial, and cultural factors. and serves as a competent and articulate expert witness during testimony." Dr. Monguio is fully licensed as a psychologist in the state of California. 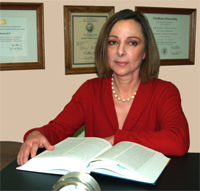 Dr. Monguio has also qualified as expert witness in the states of Washington, Oregon, New Mexico, and Nevada.